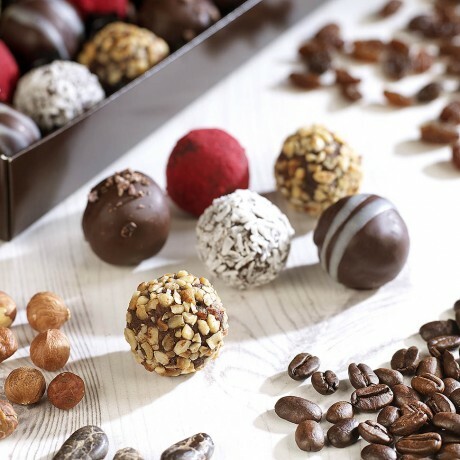 All made with pure raw organic superfoods and nothing else: no added sugar, no dairy, no gluten, no soya, no egg, no yeast, no grains, no transfats and no preservatives, flavours or colourings.g.org.e truffles are suitable for diabetics, coeliacs, paleo diets and vegans/vegetarians. Three truffles even count as one of your 5 a day, so now you can g.org.e guilt free! Shelf life: These are a fresh product, and so are best kept in the fridge and eaten within 2-3 weeks. We recomend frezzing them if you're keeping for a gift/later date, to keep them at their absoulte best. Organic almonds, organic dates, organic raw cacao butter, organic raw cacao liquor, organic raisins, organic raw cacao powder, organic raw cacao nibs, organic desiccated coconut, organic hazelnuts, organic 100% Arabica decaff coffee grounds, organic freeze dried raspberry powder, organic vanilla powder. This product is dispatched by g.org.e (Guilt-Free Organic Eating Ltd). Please note: this item has special delivery requirements so £0.45 is added to the delivery charges indicated below.